Sugarbush Valley: An ideal life: 18 days - Attend the kids prize giving. 18 days - Attend the kids prize giving. Today is last day of the school term, which also means that it is time for the annual Prize Giving Ceremony. Rumpus surprised everyone, including himself by being awarded the "Good Fellowship Award". She is extremely proud, as Rumpus sometimes disappear in the shadows of his older siblings and Asparagus' achievements. 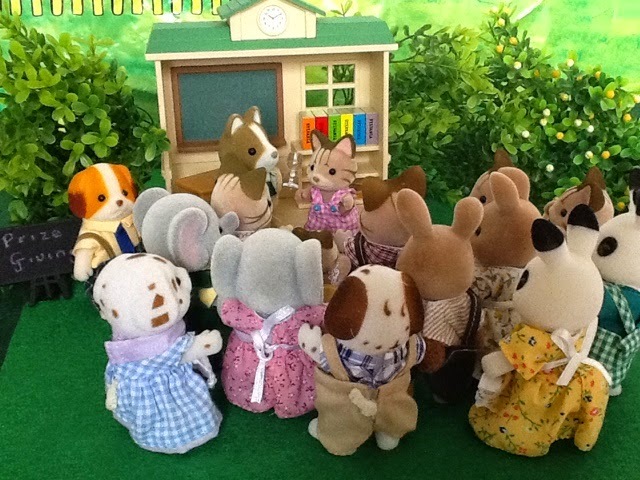 Oh wow good for Rumpus, his parents must be over the moon:) Another really cute set up, love that school building. They are so proud! And Rumpus most of all! Thank you Jane, Rumpus is so proud. Thanks for the comment Paige, yes they are so proud! Go Rufus! Awesome that children get the appreciation and support for their good behaviour :) There are enough mischeaf behaviour in Sugarbush Valley I think. And he is one of the most mischievous, but never ugly naughty! 5 Days - Saying goodbye! 6 Days - Food shopping for the vacation. 8 Days - Get a haircut and a facial. 9 Days - Getting a housesitter. 11 Days - Wrap the gifts! 13 days - Phone sister to confirm trip. 14 days - Buying some necessities! 15 days - Get broken toys fixed. 16 days - Cancel the milk delivery order. 17 days - Take kids to the Doctor. 19 days - Take the girls shoe shopping! 20 days - Baking the Christmas cakes. 21 days - Go to Skimble's concert. 22 days - Planning the trip. 23 days - Breaking the news to their friends! 24 days - Budgeting for the trip.